Itsmyivory, under jockey Jose Alvarez, winning the 11th trial to the $1.154 million Grade 1 Heritage Place Futurity on Friday at Remington Park. OKLAHOMA CITY, OK�MAY 12, 2017�Itsmyivory, a 2-year-old son of multiple stakes sire IVORY JAMES raced to a 1 � length win in the 11th race in the first of two-nights of trials for the $1.154 million Heritage Place Futurity(G1) at Remington Park. Racing for owner/breeder Bobby D. Cox, the Texas-bred gelding completed the 350 yards in :17.750 seconds to record the 9th fastest clocking from 107 juveniles who participated in 12 trials Friday night. The time was fastest enough to earn the undefeated 2-year-old an invite to the $100,000-Guaranteed Heritage Place Juvenile Invitational on Saturday, June 3rd. 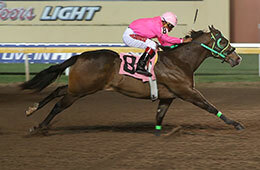 Trainer Josue Ponce saddled the homebred with jockey Jose Alvarez getting the riding assignment. Out of Itsmybay, a multiple stakes winning daughter of the stakes winning Thoroughbred sire Bag, Itsmyivory entered the race off a two-length victory in this first start April 7th, a trial for the Grade 2 Sam Houston Futurity. He has earned $10,584. For a list of the first five eligible invites for the $100,000 - Guaranteed Heritage Place Juvenile, including their times, sires, dams, owners, breeders, trainers and jockeys CLICK HERE.